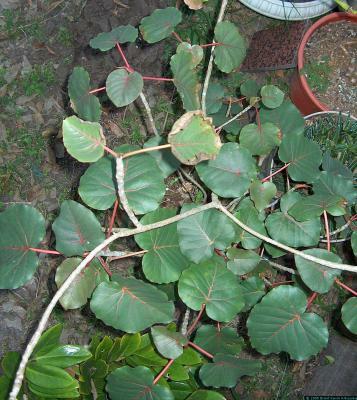 Ficus petiolaris is related to the common ficus tree you already know about, and to the fig trees. It develops a bulbous base called, among other things, a caudex or caudiciform. Whatever...in full sun it develops deep green leaves with blood-red leaf margins and veins. Very pretty. Ficus petiolaris goes dormant in the winter, and while I'm sure I could just mulch it here in south Texas, I've never tried. Since its dormant I just put it in my unheated garage and leave it alone for months on end. I know from personal experience that in the dormant season you can take the Ficus petiolaris out of its pot, wash off the soil, remove any leaves that are left, let it dry, and leave it out of the pot for weeks at a time. Do whatever you want with that info. Perhaps mail it to Grandma?